The inordinate burden of domestic work that falls on women in India might explain why they have been dropping out of jobs consistently since the post-liberalisation years. Between 1993-94 and 2011-12, India’s female labour force participation (FLFP) fell by 11.4 per cent from 42.6 per cent to 31.2 per cent, according to an April 2017 World Bank report. Feminist economist Ritu Dewan argues that if you take into account the unpaid work of women, then FLFP will, in fact, overtake that of males by six percentage points. “Women are not a priority for policy-makers. The investment in all social sectors is going down and it is going to intensify the problem of unpaid work. Take the example of public health, where the government is tightening its purse and as a result women have to take the burden of caring for the ailing person in the family. This is unpaid work,” says Dewan. She suggests that at least the effort for the right estimation of unpaid work should begin. It will help women to recognise their situation in the family and in society. As per the National Sample Survey Office (NSSO), a total of 35 per cent of rural women were working in 1999-2000. 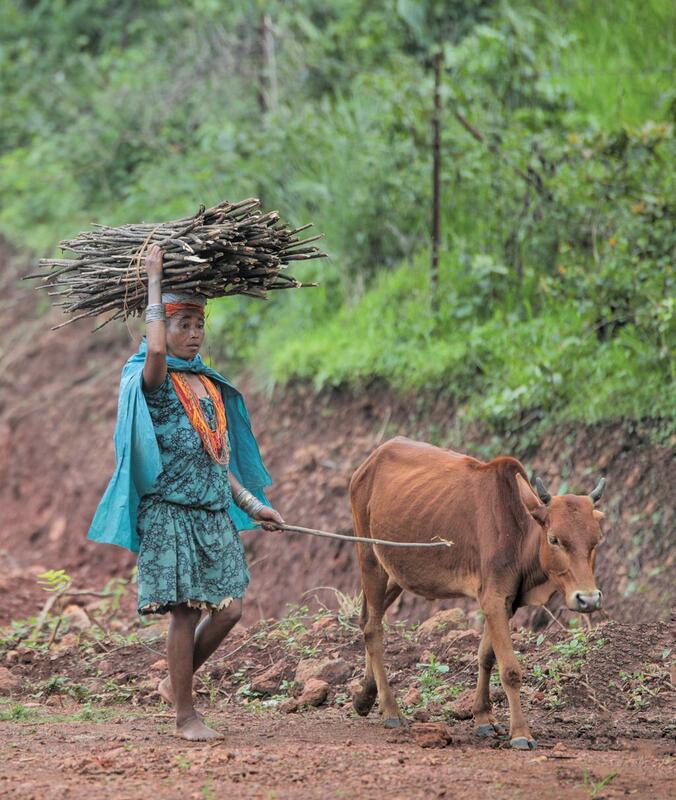 In 2011-12, only 25 per cent of rural women were working. Economist Jayati Ghosh says that the situation in urban areas is even worse. This is corroborated by the latest data from the Organisation for Economic Cooperation and Development’s (OECD), which says that an average Indian woman spends 5.8 hours every day on unpaid work while a man barely gives 51.8 minutes on similar tasks. The OECD study found that most of this time is spent on unpaid activities, such as household work and care- giving for the elderly or for children, leaving little time for paid labour or social and leisure activities. This scarcity of discretionary time is referred to as “time poverty”. The story of women in India being overburdened with unpaid work is centuries old. The effort to recognise it, however, began in 1970s at a small scale. The census of 1971 underlined that work participation of men and women in Rajasthan was 92 per cent and 15 per cent respectively. To understand the ground reality, the Institute of Social Studies Trust and NSSO conducted a study in six villages of Rajasthan and West Bengal in 1977 and found a completely- different scenario. When cattle grazing, weeding, cooking, grass-cutting and other significant housework was counted, men and women’s work participation changed completely and came out as 93 per cent and 98 per cent respectively. This clearly showed that women were contributing more but it was not recognised in the formal census. After 20 years of this survey, India conducted its first “Time Use Survey” as a pilot project undertaken by the Central Statistical Organisation in six selected states—Haryana, Madhya Pradesh, Gujarat, Odisha, Tamil Nadu and Meghalaya. It showed that out of 168 hours in a week, women spent 34.63 hours on unpaid work while men spent 3.65 hours. In 2013, the then Minister of State for Statistics and Programme Implementation Srikant Kumar Jena had said in Parliament that his ministry was actively considering to conduct a countrywide Time Use Survey to assess the manner in which people spend their day. Talking to Down To Earth, D P Mandal, director general of NSSO, said that the survey is yet to begin. Women are overburdened with unpaid work everywhere across the globe, which hinders their contribution in the formal economy. There are few steps being taken in other countries which can help India look at ways to handle its problem. In Ghana, an international non-profit, ActionAid, shows how the challenge of unpaid work can be estimated. There are 3,000 women in Ghana who have enga ged in mapping their unpaid work, generally unrecognised by the family. Although the project is aimed at the empowerment of women it categorises the effort of women in four areas including unpaid care work, climate resistant sustainable agriculture, access to markets and violence against women. For this unpaid work, ActionAid devised a model to quantify the total work done by women. The family was given a chart with columns for time dedicated to all efforts including care of children, care of adults, collection of fuelwood, collection of water, housework, cooking, subsistence farming, livestock and poultry. For self realisation of the burden of unpaid work, this documentation process was very effective. The project also worked for creating infrastructure, which can reduce the burden of unpaid work. For this, community run child-care centres were built, household rainwater storage were ideated. As a result, ActionAid claims that there was a 50 per cent reduction on time spent on child care by women who had their children enrolled at the centre. “It helped women to utilise their saved time for other tasks,” says Azumi Mesuna, project manager of ActionAid in Ghana. In Uruguay, Time Use Survey was conducted twice in 2007 and 2013. It emerged that women spent two-thirds of their week in doing unpaid work. The data gave civil society and academia a new understanding of the problem. They demanded redefinition of “care” as a collective and societal issue. Earlier, it was completely an activity within the family. This survey pushed a policy change when the Uruguay government came with a new care law. In November 2015, the government came with The Care Act, a flagship policy of President Tabare Vazquez. This law changed the concept of care. Under this new law, the government provided the right to get care to children, people with disability and the elderly. The state not only ensures care services but also guarantees its quality. For this, the government provides training to care providers and also has proper regulation to ensure it. Now quality and free care is available for all which helps women save their time. The fact about women overburdened with unpaid work in India will be properly understood only when the government conducts the proposed pan India Time Use Survey. India needs to learn from other nations and at least begin to quantify the burden of unpaid work. The evidence presented from various surveys calls for a concerted effort from all stakeholders to reach out to women (and their families) with a new value proposition: solving the problem of time poverty.